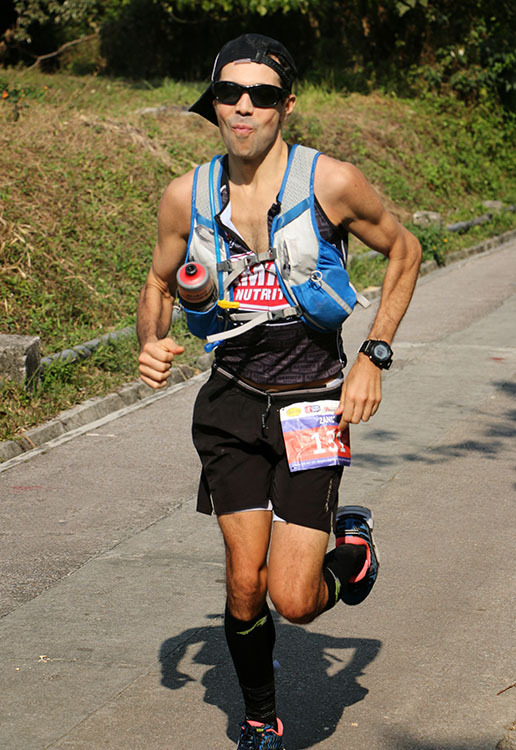 Sweating like Moses Malone, I coaxed my body up the final ascent of the Vibram Hong Kong 100k. Based on the course notes, I knew that once I reached the peak of Tai Mo Shan, then it was only 4km of downhill running to the finish. The only problem, was that I had no energy and was powered by nothing more than willpower at this point. All I could see were headlamps gaining on me from behind and pulling away from me in the distance, until they were out of sight. I had endeavored to keep pace with ultra-bud Stephanie Case Vibram HK100 Race Report: from treadmills to trails, who I had bumped into at the last checkpoint, but even she, with two bloodied knees and bronchitis, gradually climbed ahead until I lost sight of her torch. 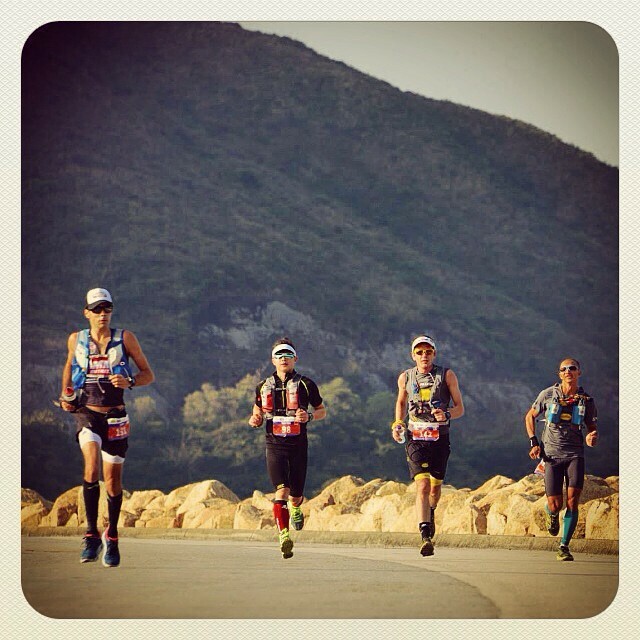 The only flat portion of the Hong Kong 100k. Training on the paved, flat streets of New York City hadn’t done much to prepare me for the onslaught of sharply ascending and descending, technical trails which I encountered throughout most of the race. By “technical,” not only do I refer to the traditional root and rock recipe, but also STAIRS. Every species of stair in the world can be found on the Maclehose Trail in Hong Kong’s New Territory. The trail was built in 1979 and consists of many kilometers of poured cement steps or uneven stone steps which were arranged in order to negotiate the steep inclines and declines. Ascending the staircases, or rather “stonecases,” was challenging in the traditional lung and quadricep burning senses, but descending presented a new set of challenges for the the uninitiated like myself. After observing the technique of experienced stair-runners who blew by me on the early downhills, I learned that the most effective technique was to hurtle down the mountain, quickly moving my feet and bouncing from stone to stone, until reaching a level section and shaking out the legs. This downhill technique saved me time, but the trade off for descending with more speed, was a quad-shredding workout. Besides a few flat kilometers in the beginning of the race, it was otherwise a neverending cycle of ascents and descents with 4500 meters of cumulative elevation gain over the entire course, ie more elevation than I had done all year in training. Feeling the burn of another incline, 60k’s in. My mind had time to wander, especially on the interminable climbs. I wondered how workers managed to transport cement uphill for the staircases to such remote and treacherous inclines. I came to no conclusion except that the stair-builders must have been in top physical condition. Here I was, wheezing towards the summit with just the weight of a water bottle and Hammer gels. I was also intrigued by the monkeys who we encountered in great numbers in one section. I was warned not to make eye contact with the apes in order to avoid confrontation, but I risked a glance, and the one young male I decided to rest my weary eyes upon was relaxing on his haunches and pleasuring himself – with both paws no less. Excited to see so much spandex? I didn’t ask. The race course was as breathtaking as it was difficult. Verdant mountainsides, apocalyptic looking city views from up high, empty beach crossings, and of course, the animal life. Also, the frequent aid stations with enthusiastic volunteers were always something to look forward to. Sushi rice, hot tea and broth soon became my aid station essentials. On the course I relied on Hammer Nutrition | Fuels & Supplements for Endurance Athletes gels and Fizz along with Endurance Amino and Anti-Fatigue caps . In spite of a regular nutrition plan, on the final ascent up Tai Mo Shan nothing would kickstart my engine. I simply endeavored to keep moving as stopping would have allowed my legs to stiffen in the cool mountain air. Runners continued to pass, and with great relief I finally summited the peak and began the final descent. My aching quads only allowed a slow trot down the switchbacking road and fresher runners continued to overtake me. It was fine, there was nothing to do, but my best effort at that point. I crossed the finish line in 13:53, 66th overall, (first American), totally exhausted, but utterly fulfilled.